(PhysOrg.com) -- Scientists of the "Planck" satellite mission present first results in a conference in Paris. In its first year in operation, the "Planck Surveyor" satellite has achieved impressive results: a catalogue with 15000 celestial objects such as galaxy clusters, quasars, radio galaxies, nearby galaxies and galactic dust clouds, 25 scientific papers, as well as the most precise measurement of the far infrared background to date, which reveals star formation in the early universe. The Max Planck Institute for Astrophysics developed important software components for Planck and is heavily involved in the scientific interpretation of the mission data. 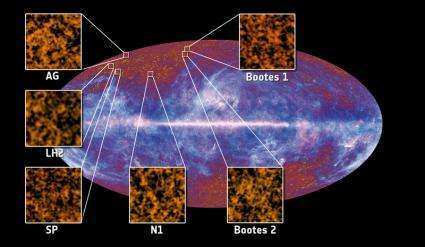 So far, Planck has produced three complete scans of the whole sky, thus fulfilling its primary objective. However, as it continues to function perfectly, the satellite will probably stay in operation until the start of 2012 and continue to provide data. 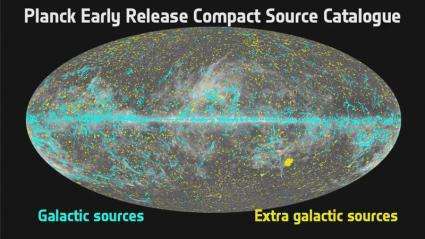 The results gained from the first year of Planck data were first presented on 11 January 2011, where many of these results are based on the Early Release Compact Source Catalogue with some 15 000 new celestial objects. The early release of this data enables scientists to arrange for detailed follow-up observations with other telescopes such as the Herschel space telescope with operates at similar wavelengths.  a detailed measurement of the far infrared emission of all star forming galaxies in the universe. The scientists can now observe the history of galaxy formation, looking back to an epoch when the universe was only 2 billion years old, just one sevenths of its present age. The results presented at this Planck conference mainly cover the astrophysical by-products of the Planck mission. The data related to Plancks primary goal, the cosmic microwave background, the resulting conclusions regarding the age, structure and composition of the universe as well as insights into its origins will probably be published in 2013. Until then, the noise signal from space but also from the instruments has to be understood in more detail. The team at the Max Planck Institute for Astrophysics will contribute to this effort  their software for simulating and processing the data will continue to be in daily use. The software development at the Institute received financial support from the Max Planck Society and Germany's national research centre for aeronautics and space (DLR). We are on the verge of a quantum leap in our understanding of the beautiful universe.